It is amazing that Coelogyne usitana has only recently been discovered. This is a wonderful species from the Mindanao island in the Philippines, Coelogyne usitana (see photo right) has large flowers that actually hang down on long stems White petals tinged with yellow and a deep mahogany brown lip. The flower spikes hold one flower, when if dies of another forms below. In the image you can see the nodes where flowers have formed. The flowers are large for the size of the plant, reaching around 7 – 8 cm across. One of the lovliest of the species we have seen, however as it has only recently been discovered and rarely available for sale in Australia. Discovered in 1999 and first described 2 years later, when it was first exhibited it immediatly won praise and merit awards. 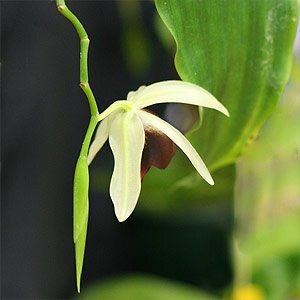 Coelogyne usitana is an epiphytic orchid and requires warmth, humidity and part shade. Try growing in an orchid basket where it will receive good ventilation in a moist but well drained mix. With proper care the flower spikes of Coelogyne usitana will reach .7m (2ft). We have seen photographs of plants with a red lip, however at this stage we believe this to be poor colour correction. Keep moist with only partial drying of the growing medium between watering. Repot every 2 – 3 years using a fine to medium pine bark mix. Do not overpot as they like a confined root space. Good filtered light is best, no direct sun. Growth rate is regarded as medium.